Nigerian Teen Founds 'Street Priests' To Help Homeless Kids In His Hometown : Goats and Soda James Okina of Calabar, Nigeria, was on his way to a soccer match when a chance encounter with a homeless kid changed both of their lives. James Okina, founder of the nonprofit Street Priests, poses with street kids in Calabar, Nigeria. James Okina was being a typical teenager. Three years ago, he was hanging out on the streets of his hometown of Calabar, a port city in southern Nigeria, on his way to watch a soccer match at a secondary school. Then something happened that turned Okina into a very untypical teen. He met a 13-year-old homeless kid named Frederick. The two struck up a conversation. The boy told Okina, then 15, that he was dancing in bars to earn tips to buy food and meet his other basic needs. James Okina began to wonder: Why was this kid living on the streets? He spoke good English, he seemed bright. Maybe if he had a place to sleep and could go to school, Okina thought, the kid could one day have a decent life, a life of dignity. And so, Okina says, he "felt compelled to change the lives of street children." 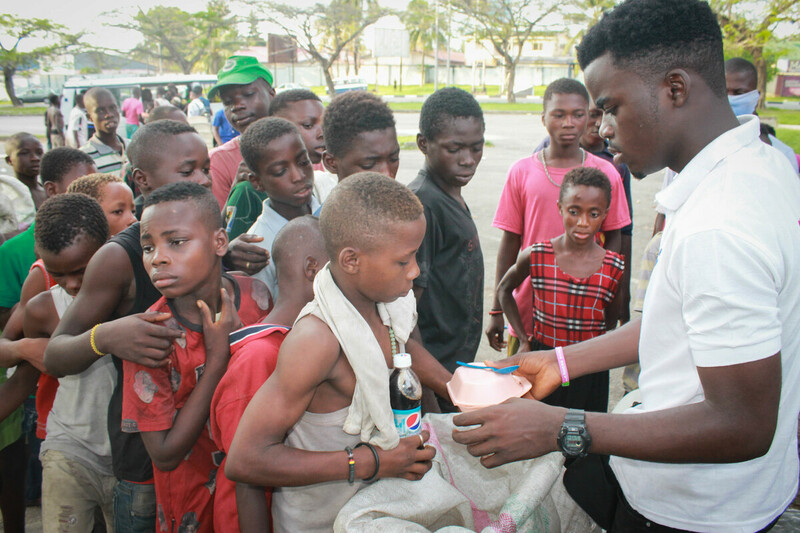 James Okina hands out food to some of Nigeria's street kids. That's an ambitious goal for anyone, let alone a teenager in Calabar. According to a UNICEF report, children living on the street are a "phenomenon of grave concern in Nigeria." Some are orphans — there are an estimated 8.6 million orphaned children in Nigeria. And some have left "unhappy homes," UNICEF reports. They live under bridges, in railway stations and in markets. They earn money to survive in various ways, including selling plastic bags of water and washing windshields of cars stopped in traffic. They're likely among the 10.5 million Nigerians of school age who do not attend school. And they're at risk. UNICEF notes: "Those children are more prone to illnesses, malnourishment, drug abuse, crime, accidents, arrest and harassment by law enforcement agents, and are also at risk of being trafficked." So how could Okina help these kids? His first idea was to use some of his own money — he had a part-time job with La'Shakara Wears and Branding, a clothing designer and manufacturer, so he had money in his pocket. He paid about $50 to cover the fees for a year of schooling for two children. Then he had another idea. Maybe he could help the kids earn their own money — off the streets. He invited some of the street children to meet Alemoh Anselm Igemokhai, at the time the general manager of the clothing company. And he asked if they could be hired to sweep and clean the office. That request made Igemokhai nervous for two reasons. First, he says, "I was worried that having these kids around the office posed some sort of security threat because people say the [street] children are responsible for mayhem and criminal activities." Igemokhai also wasn't sure James Okina knew what he was doing. "James was so young and had not showed me any concrete plans for the kids, and I'm not sure he had [any]." He wasn't the only doubter. Even Okina's mother "struggled to understand the project." She, too, worried about his lack of plans — as well as the fact that he was hanging out with street kids. But Igemokhai eventually said yes and hired four kids. And Okina was on his way. "I started from nothing," he now reflects. "Everything came from my pocket money. Then later my friends, who now make up my core team members, joined in and it was as though we were all born into this." "They gave their pocket monies, too, time and everything. Plus we were mentored by the CEO of La'Shakara, who understood my ambition and gave his support. He was there to encourage and throw in bit of advice." The teenager started visiting alleyways and notorious neighborhoods in Calabar to spend more time with street kids. And it wasn't hard to start up conversations because of his own background. Okina himself had turned to a gang for a sense of belonging after his parents separated when he was 8. He went to live with his father, but his dad wasn't around much of the time. Okina stopped paying attention in school and played truant. But he had a change of heart after a cousin came to stay with him, and, says Okina, "I saw that he led a more quiet, dignified life." After months of talking with the kids, in August 2015, Okina founded Street Priests, a nonprofit that is tackling the problems of street children in Calabar. "A lot of people say that name Street Priests is too religious, we need to change it," he reflects. "But I explain that we are priests, but our church is on the street. We have a calling, like typical priests — to reach out to children on the streets." Gradually, Okina began to make bigger plans. He tried to find places for the kids to live, mostly at the church where he worships. To raise money, he wrote to local charities and visiting charitable individuals so he could get the funds to pay school tuition for more street kids. "Though some still stayed on the streets — we can't find shelter for all of them — we got a place at the Christ Embassy church where we store their school items; there is also bathroom and a room to study," he says. Now, Street Priests is 2 years old and is run by seven volunteers, ages 18 to 22. A child-rights group called Basic Rights Council Initiative provides mentoring and support. And the group has had success raising money via Facebook solicitations, sharing stories about street children, and by staging special events. The young volunteers and Okina, now 18 and a sophomore at the University of Calabar, work on the program in between classes and part-time jobs. Other charities and organizations in the area have noticed Street Priests' work. 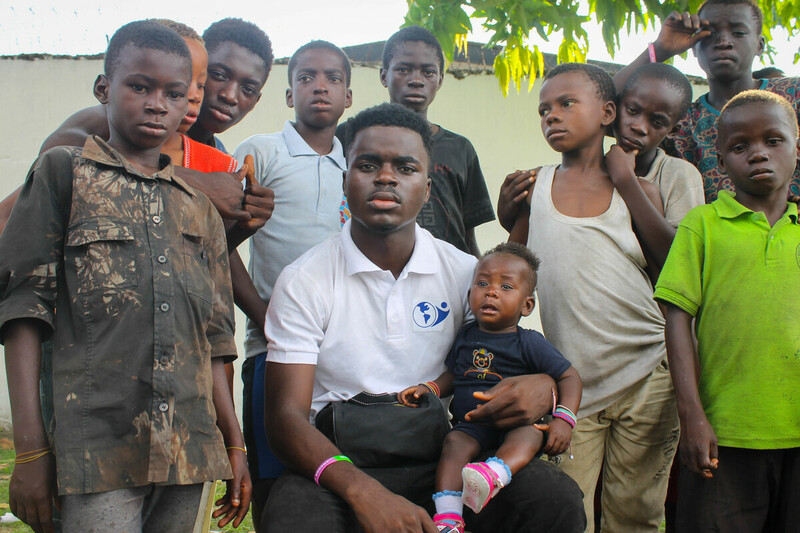 "Okina and his team have been successful in rehabilitating and mentoring street children," says Grace Ihejiamaizu, who teaches sociology at the University of Calabar and manages iKapture Networks, which trains students and out-of-school youths in Nigeria. Okina has also been honored for his work. In 2015, he received $10,000 as one of the winners of the Future Africa Leaders Award, sponsored by Nigerian preacher Chris Oyakhilome, founder of the Christ Embassy, one of Nigeria's biggest megachurches. Okina was also named a 2017 Global Teen Leader by Three Dot Dash, a global youth initiative of New York-based We Are Family Foundation. For Okina, the biggest thrill is seeing how lives are turned around. Daniel, 15, who used to scavenge the streets for metal to sell as scrap, is now enrolled in school thanks to Street Priests. He beams with pride as he talks about his dreams. "I hope to become an actor one day so I can influence a lot of people and help them to do good things," he says. As for the boy who inspired Okina — he's a success story, too. With help from the Street Priests, the homeless boy is back to school and has been reunited with his mother. "We met the mother and discussed the challenges that pushed the boy to the streets and explained why she needed to take him back," says Okina, who says the boy's mother now pays his tuition. But he's still dancing during weekends, Okina says, "because he just loves dancing." Linus Unah is a freelance journalist covering global health, conflict, agriculture, and development in Nigeria. Find him @linusunah.